I have been asked by different people if I might be interested in blogging about my experience as a foster mom, and I have always been interested but just really didn’t know if I would have the time. With that said, I still don’t know that I have time, but with it being National Foster Care Month, I was reminded recently that I do have time to at least write some of my thoughts down and see where it goes. 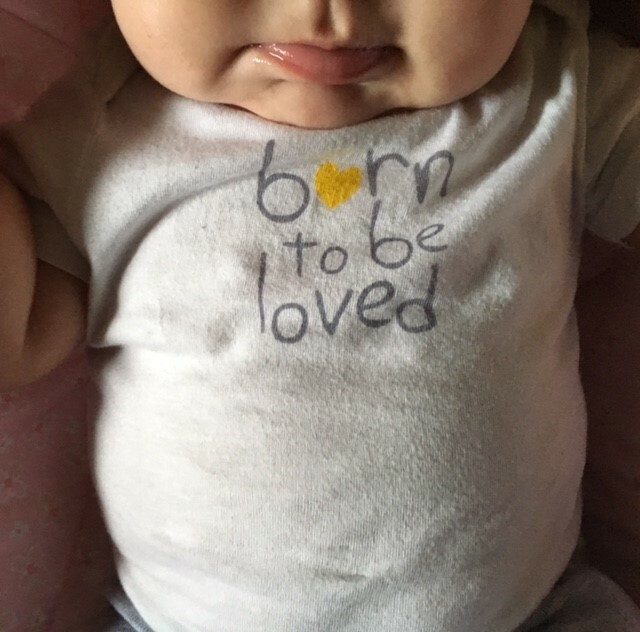 As I got the kids dressed recently, I pulled out this onesie for my 6-month-old. I bought it a few weeks back and really had forgotten it was in the drawer, but as soon as I saw it, I knew she needed to wear it. “Born to be loved”. The number-one thing I hear from people when they find out that I am foster mom is, “I just don’t know how you do it. It would be too hard to give them back.” I used to just smile and say, “Thank you,” but then I feel like the Lord gave me a clear response to say back to them. I do my best to respond with love, and hopefully, part of my explanation and encouragement might get them involved in some way as well. As a 40-year-old (ugh), single woman, I do not think I would be shocking anyone if I told you that I have had some heartache in my life. I’d like to say that I have been in love, but somehow in this earthly world we live in, I think our view of what real love is can get very distorted and hide itself in what our human brains think is love or feels like it at some point in our lives. I do know that my heart has been broken, and I desire to have someone love me unconditionally and be my partner for the rest of my life; someone to do life with, as some say. Heartbreak hurts, and those have been some of the darkest times in my life, but through each experience, I feel that the Lord has taught me more and more what real love should look like and has given me the desire to keep searching for it until it looks more and more like Him, and each time my heart has eventually been healed. I have now had the privilege of fostering three babies. The first baby I fostered went home to his birth mom after he had been with me for about eight months. I had witnessed so many “firsts” for him – first time he sat up, first time he ate baby food, first time he took steps, his first words. I cannot really describe what it felt like that first night when I knew he was not sleeping in his crib in the other room. This was not a first I wanted to remember like the rest of them. I mourned that loss for months, but thankfully, was able to continue a relationship with his family, which is really one of the ultimate goals of fostering known as bridging. It was through this time that the Lord showed me that although this is probably the hardest thing I have been through, my heart can mend, and I can slowly find restoration through Him, but these babies have no comprehension of this. They were born to simply be loved, and it is my responsibility to show them the love they so richly deserve. Because of what Christ did for me, I know what true sacrificial love is, and fostering gives me the opportunity to love just like He did (or as closely as I can). How could I possibly not love these babies as they need, even if it is only for a period of time? Although, it has also taken me months to really be able to say this, it is also my responsibility to love their families that way, too. I know from personal experience this is not the easiest thing to do because often times we might not agree on some things — well, a lot of things — but I still have to look for opportunities to be Jesus to them, too. Now don’t get me wrong. I know not all are called to foster, but there are so many other ways you can also show this love to the more than 11,000 children in our state alone who are in the foster care system. Thankfully, we have had an enormous amount of support shown to us these past three years through showers, meals, gift cards, hugs, time spent, listening ears… just to name a few. I would encourage you to give it some thought, pray about it and really seek what He might be asking you to do with this information I have given you today. I am more than willing to talk to you about the process I went through and answer any questions you might have. I would love to tell you about Anna’s House, the organization of which God connected me that supported me through this whole process and provides for our family in so many ways. EDITOR’S NOTE: May is National Foster Care Month. Those interested in more information on foster care and Oklahoma Baptist Homes for Children’s newly-founded “One Such Child” program visit http://www.obhc.org/foster-care or contact Teri Blanton, OBHC foster care coordinator at (405) 640-0622. Kate is an OKC native who is a certified athletic trainer and teaches for an online educational program. She is involved in ministry at Quail Springs Baptist Church. These days, she is busy chasing her 2-year-old and loving on the other sweet ones God has placed in her care through the OK Foster Care. Kate Downing has written 1 posts. Are you in sin if you are depressed?